I don’t know about you, but if I don’t start my morning with a cup of coffee, my morning doesn’t really start at all. It’s like my brain protests proper thoughts when I’m without caffeine. Some may call it an addiction; I just call it a delicious routine. 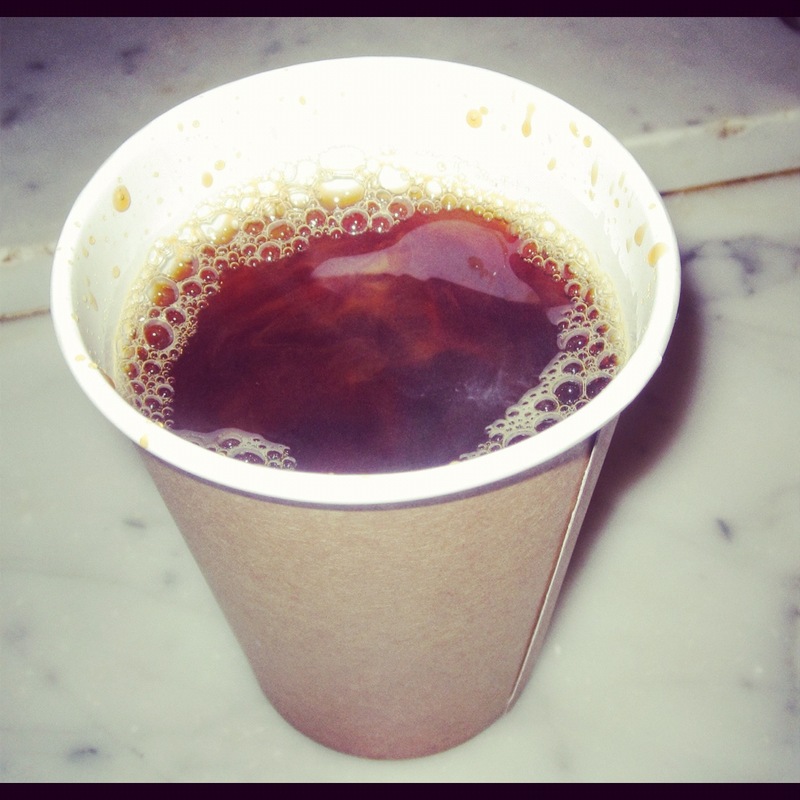 If you are a coffee drinker, then you know not every cup is the same, or even similar. And the power of a great cup of coffee is like the power of a great kiss. It has the ability to change an entire day for the better. That’s the way it goes, and don’t forget it goes the other way too. A bad cup of coffee, almost worse than no cup at all, is enough to turn me into a Bite-Sized B*tch. Fear not because I have found the place where good moods are born and it’s called Blue Bottle. This coffee shop is not your average Starbucks coffee shop. 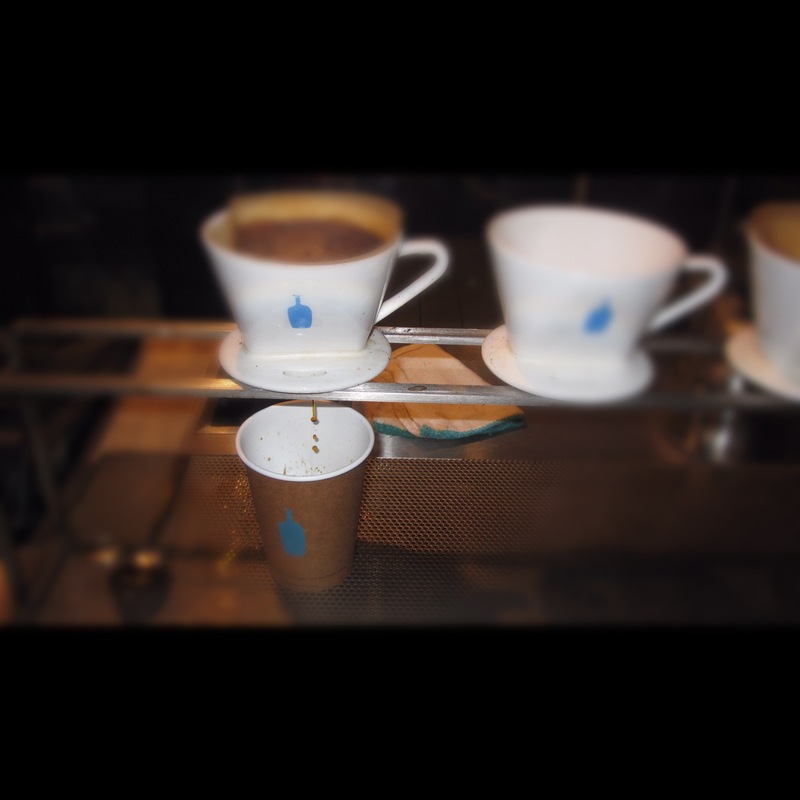 Coffee at Blue Bottle is prepared meticulously. They have several methods of preparing coffee, including siphon, drip, French press and espresso, but no matter the preparation, the end result is liquid happiness. A siphon coffee maker, which is also called a vacuum coffee maker uses two chambers to brew coffee. Not only do they look seriously impressive, they brew a mean cup coffee. If you are looking for something a little more low key, but still dramatic, you can order a drip. Each cup of coffee is individually made to order, so it’s kind of like a present. Of course, I love presents, and I love coffee, so I had to have a drip. The coffee was strong and complex with earthy notes. With a little raw sugar and whole milk, it was a rich and creamy delight. At a place with so many options, it’s hard to just pick one thing. So naturally, I didn’t. I also had a latte, which was smooth as silk. 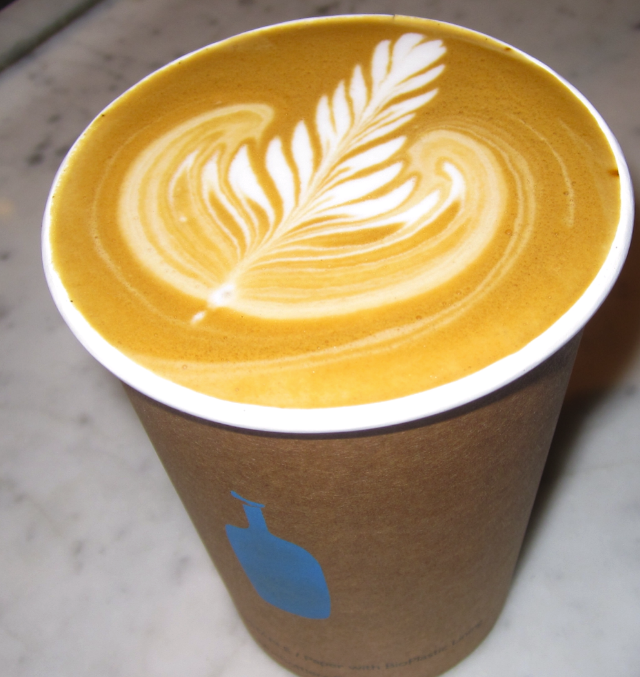 The only downside to Blue Bottle? The line is out the door. I went at 5:00 pm on a Friday and I waited about 15 minutes for my coffee. Totally worth the wait, but totally annoying. Also, you’ll have to go to San Francisco or Brooklyn to get this tasty treat, so I chose Brooklyn. A trip to Brooklyn wouldn’t be complete without a hipster spotting, and this spot was worth mentioning. A hipster who kind of looked like Robinhood, hat and all, ordered a cup of coffee after I did. He had the good sense to order a drip as well. But, this sneaky son of a gun took my coffee instead of his. Robinhood lives up to his name, stealing from the rich and giving to the poor, if by rich I mean well dress and poor I mean wears a funny looking hat. Oh yea, can’t forget to mention that Coolhaus sells Blue Bottle iced coffee, and you know how much I love Coolhaus. This entry was posted in Restaurant and tagged Brooklyn, Coffee. Bookmark the permalink.